I've wondered for a while whether the "bright clouds" on Uranus are in any way related to the Io-Jupiter flux tube and to the Io / Europa / Ganymede footprints in Jupiter's auroras? Including the recent revelation that the Io-Jupiter flux tube(s) appear to close the circuit in both the northern and southern hemispheres. Giving me a little competition, eh? 've wondered for a while whether the "bright clouds" on Uranus are in any way related to the Io-Jupiter flux tube and to the Io / Europa / Ganymede footprints in Jupiter's auroras? Including the recent revelation that the Io-Jupiter flux tube(s) appear to close the circuit in both the northern and southern hemispheres. Yes indeed, my wonder too. quite indicative that such relations as you state, Micheal, could be found on the other gas giants too. "The outer ring of Saturn is blue and has Enceladus right smack at its brightest spot, and Uranus is strikingly similar, with its blue ring right on top of Mab's orbit," said Imke de Pater, professor of astronomy at the University of California, Berkeley. seem to be huge red flags. more supplied by the moons themselves. Are they saying that Io, enceladus and the like are being bombarded by meteorites? Michael, which moon could be functioning in the Uranus-system just like Io-Jupiter? Do you think there is something more active going on at the Uranus-system because of the repeated quotes in the posts above that the ring system is chaotic? where analysed and it was discovered that the magnetic field is strong, yet offset from the axis of rotation by 58.6°. seeing the process in action . Jupiter and Saturn, with a bow shock facing the Sun, and a long magnetotail trailing past the dark side. magnetotail forming a helix shape rather than the expected tubular one . magnetic influence producing the atmospheric aurora on Uranus. But Uranus and Neptune buck the trend. Their magnetic fields are tipped over, with the magnetic poles lying closer to the equator than the rotational axis of the planets. And their fields are also considerably more complicated than those of Earth and the other planets. Rather than being like the field of a bar magnet, they are strongly quadrupolar - more like a combination of two bar magnets with two north and two south poles. "The discovery that Uranus' and Neptune's magnetic poles are so different than the geological poles around which the planets rotate destroyed the paradigm set by Earth, Jupiter, and Saturn," says Jeremy Bloxham from Harvard University. Bloxham and coauthor Sabine Stanley, a graduate student from Harvard, have developed a model, published in a recent issue of Nature, that might explain the unusual magnetic nature of Uranus and Neptune. Planetary magnetic fields are believed to be caused by the dynamo effect - complex motion in an electrically conducting fluid region of the planet, coupled with the planet's rotation, generates a magnetic field (see Core business for more on dynamos and Earth's magnetic field). Like a gas burner causing the rolling of boiling water in a pan, the small but extremely hot solid-iron inner core of the Earth drives the convection in the molten iron outer core, generating the Earth's magnetic field. The magnetism of Jupiter and Saturn have been modelled in a similar way. The lack of a magnetic field on Venus is believed to be due to its slow rotation, 243 days for one revolution, which is not quick enough to generate a magnetic field. By changing two aspects in the mathematical models used to model Earth-like fields, Stanley and Bloxham were able to simulate a magnetic field similar to that of Uranus and Neptune. Instead of a thick convecting layer around a small solid core, their model has a thin convecting shell around a larger inner core comprised of a stable fluid ocean surrounding a smaller solid centre. They believe that it is the stabilising effects of a solid conducting core in the Earth-like models that anchors the magnetic field and allows a stable dipolar field to be maintained. When a thin convecting shell sits above a fluid layer instead, the reduction in stability, and the relatively smaller scale at which convection can occur, result in more complicated magnetic fields like those seen on Uranus and Neptune. Its magnetic field is further offset, leading to a complex interaction between the solar wind and this planet. Due to its great distance from the Sun, and the fact that it has very little internal heating, the planet's temperature is very low. At the top of the atmosphere it is so cold that methane (CH4) condenses above the clouds. There is a considerable magnetic field around the planet which is offset from the centre, and is inclined at 60° to the rotational axis (as shown in the previous diagram). This magnetic field extends far out into space and envelopes all the Uranian satellites. The discovery of Uranus' and Neptune's non-dipolar, non-axisymmetric magnetic fields1, 2, 3, 4 destroyed the picture—established by Earth, Jupiter and Saturn5, 6—that planetary magnetic fields are dominated by axial dipoles. Although various explanations for these unusual fields have been proposed3, 7, 8, 9, 10, the cause of such field morphologies remains unexplained. Planetary magnetic fields are generated by complex fluid motions in electrically conducting regions of the planets (a process known as dynamo action), and so are intimately linked to the structure and evolution of planetary interiors. Determining why Uranus and Neptune have different field morphologies is not only critical for studying the interiors of these planets, but also essential for understanding the dynamics of magnetic-field generation in all planets. Here we present three-dimensional numerical dynamo simulations that model the dynamo source region as a convecting thin shell surrounding a stably stratified fluid interior. We show that this convective-region geometry produces magnetic fields similar in morphology to those of Uranus and Neptune. The fields are non-dipolar and non-axisymmetric, and result from a combination of the stable fluid's response to electromagnetic stress and the small length scales imposed by the thin shell. Rotation of their magnetic fields was used to determine internal rotation period for Uranus and Neptune. They turned out to be 17.24 hours for Uranus and 16.11 hours for Neptune. However, outer atmosphere on Uranus rotates at about 16 hours. Fastest winds blow at the north and south poles, not at the equator. Finally temperature at the poles of Uranus seem about the same even though one pole has been in the dark for 42 years. (Note that Uranus rotates in a retrograde manner). On Neptune, the outer atmosphere also rotates at different rates. The Great Dark Spot at 22°S rotates about the planet every 18.3 hours. At 55°S, a small dark spot takes 16 hours. Also, the Great Dark Spot tends to circulate about in a counterclockwise fashion. While the white clouds continue to be seen, subsequent high-resolution Earth-based images reveal that the Great Dark Spot has faded. Uranus has both a magnetic field and a magnetosphere. However, Uranus' magnetic pole is inclined by 60° to the rotation axis. In addition, it is offset from the center of the planet by 1/3 of a planetary radius. The question is still open as to what causes the magnetic field. There probably is no metallic hydrogen so there must be some other type of dynamo effect. In 1989, Neptune was also found to have a magnetic field. It likewise inclines to the axis of rotation by 47°, similar to Uranus. Thus, an inclined off-center magnetic pole is not unique to Uranus. Both planets have a magnetosphere containing trapped plasma. Even more surprisingly, precise analysis of the data reveals that the orbits of Uranus's family of inner moons have changed significantly in the last decade. Collectively, these new discoveries mean that Uranus has a densely packed, rapidly changing, and possibly unstable dynamical system of orbiting bodies. "The new discoveries dramatically demonstrate that Uranus has a youthful and dynamic system of rings and moons," says Mark Showalter of the SETI Institute. "Until now nobody had a clue the rings were there, we had no right to expect them." URANUS: Uranus appears to have very little, if any, generating of internal heat. Each hemisphere directly faces the Sun for a couple of decades, and its northern hemisphere is just coming out of the deep freeze. By 2007, the Sun will be shining directly on the equator. As the position of the planet with respect to the Sun changes, its atmosphere appears to be waking up and showing hotspots. StefanR wrote: Michael, which moon could be functioning in the Uranus-system just like Io-Jupiter? It's [at least] Io, Europa and Ganymede that ALL have footprints in the Jovian aurora. In this Hubble telescope picture, a curtain of glowing gas is wrapped around Jupiter's north pole like a lasso. This curtain of light, called an aurora, is produced when high-energy electrons race along the planet's magnetic field and into the upper atmosphere where they excite atmospheric gases, causing them to glow. The aurora resembles the same phenomenon that crowns Earth's polar regions. But this Hubble image, taken in ultraviolet light, also shows the glowing "footprints" of three of Jupiter's largest moons: Io, Ganymede, and Europa. Q1: Where are the footprints of Jupiter's moons, and what causes them? A1: Each footprint is represented by a bright dot. Io's footprint is at far left; Ganymede's is just below and to the right of center; and Europa's is to the right of Ganymede's signature. These emissions, produced by electric currents generated by the moons, flow along Jupiter's magnetic field, bouncing in and out of the upper atmosphere. They are unlike anything seen on Earth. Electric currents following magnetic field lines. Field-aligned currents? Birkeland currents? Looks like it! The Wikipedia article on 'Birkeland current' wrote: A Birkeland current generally refers to any electric current in a space plasma, but more specifically when charged particles in the current follow magnetic field lines (hence, Birkeland currents are also known as field-aligned currents). Birkeland currents often show filamentary, or twisted "rope-like" magnetic structure. I'd wager good money that if Io's interaction with Jupiter's auroras is via a set of "flux tubes" (1,000,000+ Amp current) closing in both the northern and southern hemispheres, they'll probably eventually find that Europa and Ganymede will have very similar flux tubes connecting them to the auroral footprints. I assume here common features arise from common cause (Occam's razor, I suppose). 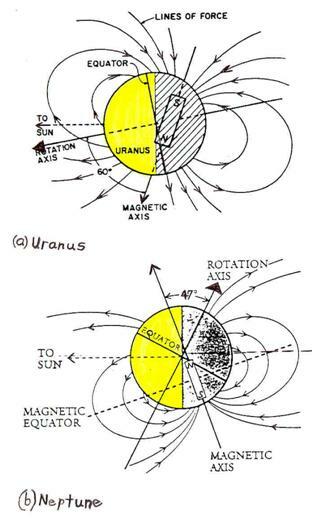 Sketch of the magnetosphere of Uranus in 1986 at the time of the Voyager encounter, from Bagenal (1992). Of the planets with atmosphere-magnetosphere interactions, Uranus has been studied very little. This system is quite interesting, however, like that of Neptune (but Neptune is too far to be observed with HST). Uranus has a highly asymmetric magnetosphere because its magnetic dipole is largely tilted with respect to the spin axis, which in turn has a high obliquity. During the Voyager encounter the spin axis was basically aligned with the direction of the incoming solar wind. In a 17.24 hr planetary rotation, the magnetic field rotated around this direction, but the magnetic north pole remained facing that direction. Sketch of Neptune's magnetosphere during the Voyager encounter in 1989, from Bagenal (1992). Recently, the magnetosphere of Uranus has resembled more that of Neptune in 1989. Uranus is now in a new season, and the orientation of the magnetic field changes largely during a planetary rotation, so it is quite different to that of 1986. The magnetic field alternates between pointing towards and way from the Sun. For Neptune, the plasma re-organized from a single to a double plasma sheet structure during a single planet rotation. Uranus should be undergoing some of this now, although the magnetospheric configuration should remain more closed and thus more amenable for detection of auroral emissions. This figure was published by F. Herbert and B. Sandel (1994) and it is a map of Uranus' H2 emissions (im magnetic coordinates) made from Voyager UVS observations during the encounter of 1986. 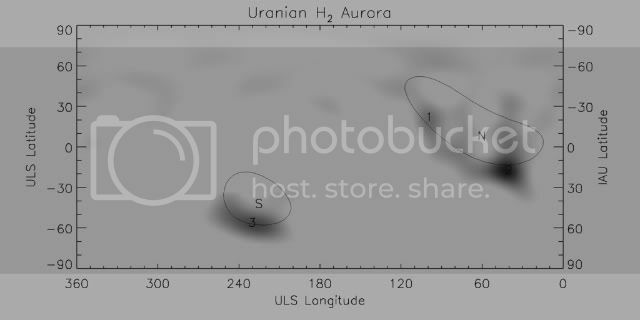 In the Voyager 2 flyby of Uranus in 1986 the UVS experiment was able to detect aurora on Uranus in the molecular hydrogen emissions. This is shown in the figure above. The aurora did not show continuous emissions along ovals. Instead, the aurora were seen as enhanced regions of emissions mapping to the magnetotail. They fall along the predicted north and south auroral ovals mapping to 5 Uranus radii (overplotted in the figure). The north/south brightness ratio of the emissions agreed with diffuse precipitation (scattering of particle into the loss cones) as the relevant mechanism. Since Uranus has been visited only once by spacecraft, remote sensing studies of airglow and auroral emissions are quite critical for this planet. Uranus relatively low gravity and high (750 K) upper atmospheric temperature produces a highly extended atomic hydrogen corona, and solar and interplanetary Lyman alpha emission is scattered by the upper atmosphere. The far distance from Earth, combined with complex rotational and magnetic field geometries, produce an intrinsically weak Lyman-alpha emission that has been difficult to observe and most enigmatic to interpret (cf, Ballester 1998; Herbert and Sandel 1999). In the 1980's IUE had detected large time variations in Uranus dayside H Lyman-alpha emission, which were interpreted as the first indicators of the planet's auroral activity (and magnetic field). However, Voyager could not resolve auroral H Lyman-alpha in the sunlit hemisphere, while it did find localized H2 aurora (as shown above). The Voyager data were time-averaged throughout the whole encounter, so they could not yield temporal information. Was the time variability observed by IUE real? Due to bursty, localized aurora? This figure was presented by Ballester et al. at the 1998 DPS meeting. It is an image of Uranus obtained with the HST STIS instrument with a technique that isolated the H Lyman alpha emissions at 1216 Ang from the bright reflected sunlight at longer wavelengths. The disk is seen in scattered solar and interplanetary Lyman alpha. Unfortunately, the aurora was not active in H Lyman-alpha emission during the HST observations. ... bogus dark matter "collision"! Various collision hypothesis' have been invoked to explain the extreme axial tilt of Uranus, but I never could understand how that could explain the accompanying tilt of the satellite system as well. It seems that a "gravity only" interpretation leaves much to be desired, at least in the case of the Uranian system, because not only is the planet tipped on its' side but so are the orbits of all of its' major satellites. Some of the moons orbit in the "correct" plane -- they circle Uranus pole-to-pole. The Great Dog wrote: Some of the moons orbit in the "correct" plane -- they circle Uranus pole-to-pole. Yes, that is true for the so called "irregular" moons which are not much more than chunks of rock (or ice?) The five major (spherical bodies) and 13 small inner moons have orbits that are aligned with the axial tilt of Uranus. The tilt of Uranus is explained by the fact that the relative field strengths of the planetary charge fields of the planets inside and outside Uranus are about equal. It is explained by Miles Mathis here: The Cause of Axial Tilt, part 1. Miles Mathis wrote: Let us study the opposite effect from Mercury, on the planet Uranus. Mercury is perturbed from one side, and has very little tilt. Uranus is perturbed equally on both sides, and has a lot. First of all, Uranus is the only planet, save Mars, that has planets larger than itself on both sides. This is important. Even more important is how the size and distance of these planets create a balanced field. Uranus has a tilt of about 97.77 degrees, or about eight degrees from flat, so we would expect fairly balanced fields on both sides of Uranus. Saturn has a charge field that is 2.328 times as dense as Neptune's (charge density differential = mass differential x density differential—see below for clarification) and is .887 as far away. This gives Saturn a relative charge density of 2.3281/4 = 1.235. Neptune's is 1/.887 = 1.128. The difference between them is 4.53%. The first bomb has just dropped. Check your pulse. If not for further perturbations, Uranus would be tilted to 94.1 degrees. Wouldn't that be evidence that there has been a significant variance in the Birkeland currents in this part of the galaxy? Would a lessening of the power coming from the Sun cause the Earth to tilt less? or more? Or could it be that the power coming from outside the solar system has increased, making there appear to be a closer balance between the power we receive from the Sun and the power we receive from elsewhere?